If you would like to appreciate the difference in Burt Reynolds as an actor and Burt Reynolds as a personality, all you need to do is compare this film to the sequel that Reynold directed himself. I have not gone back and looked at my comments on Gator, but it was an entry in the Movie A Day blog several weeks ago. I think I mentioned at the time that I was going to be looking at these out of order. I'm really glad I did, because this film is far superior to the second effort. The same character is played with swaggering machismo (Ma-cheese-mo might be the better term) in Gator. There, Reynolds is amused by everything he does and engages in a huge amount of mugging for the camera. In White Lightning, he plays it straight. The trademark self referential cackle comes out only a couple of times and it is pretty well placed. This is a fine action thriller from the early seventies that plays tightly and makes some sense of the time and place in which it is set. It was less then ten years before this movie was shot, that three college students were murdered in Mississippi for trying to register black voters. College protesters and malcontents were never appreciated south of the Mason-Dixon line. Today, we might wonder what the fuss was about in the Bob Segar song, "Turn the Page". Did people really get uptight about a haircut and try to provoke fights by impugning a mans masculinity? The answer is yes, and a couple of college kids being ruthlessly murdered for challenging the local sheriff was perfectly believable in 1973. This movie opens with a basically wordless cruel killing. Two guys tied to cinder blocks are towed out on a swamp like lake in a small boat. The sheriff then blows a hole in the boat and calmly rows away with his partner. This set up is going to justify a lot of behavior later in the film by our hero. One of the kids was Gator's "good" brother, and no corrupt local yokel is going to get away with this. There is much to admire about this well paced, tough little picture. As we were listening to it, both Allison and I thought we recognized music cues that had been used elsewhere. She thought it was "Inglorious Basterds" and I thought, "Kill Bill". 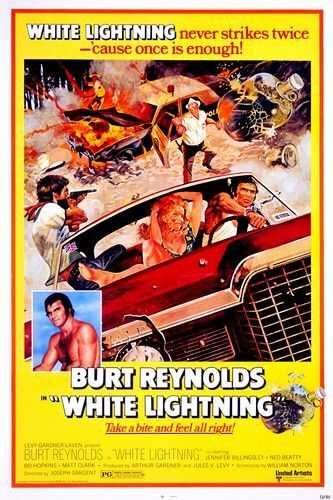 It turns out we were both right, Tarantino uses musical cues from White Lightning in both films. She did not like the trailer, she thought they were selling it as more of a comedy. I on the other hand think the trailer works quite well, the cheesy tag line that "White Lightning never strikes twice because once is enough" is perfect for the drive-in mentality that this picture also exceeds. Too bad they did not take that advice and skip the second film. It wasn't bad, but it really sullies the memory of this forgotten gem. I found this ad on line, notice that today's movie was playing at the Gold Cinema in Alhambra.